The Middle Park Stakes was founded by William Blenkiron, and it is named after his stud at Eltham. It was established in 1866, and was initially titled the Middle Park Plate. It was originally open to horses of either gender. The race was formerly staged during Newmarket's Cambridgeshire Meeting in late September or early October. It was restricted to colts in 1987. It became part of a new fixture called Future Champions Day in 2011. 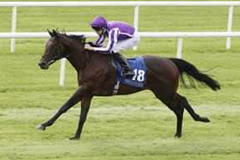 The Middle Park Stakes was added to the Breeders' Cup Challenge series in 2012. The winner now earns an automatic invitation to compete in the Breeders' Cup Juvenile Sprint. The leading horses from the Middle Park Stakes sometimes go on to compete in the following season's 2,000 Guineas. The first to win both was Prince Charlie (1871–72), and the most recent was Rodrigo de Triano (1991–92).